“We didn’t notice right away. We couldn’t feel it. We did not sense at first the extra time, bulging from the smooth edge of each day like a tumor blooming beneath skin. When 11-year-old Julia wakes up on a quiet Saturday morning, it seems like an ordinary October day in her coastal California suburb. Her best friend is stirring in the plush sleeping bag next to Julia’s more utilitarian one, and soon they will be on their way to their weekly soccer game. However, the illusion of normalcy is shattered when a shy, bearded scientist appears on the news to announce that the Earth’s rotation has begun to slow. In fact, the day grew fifty-six minutes longer overnight, and the slowing shows no sign of stopping. People react to the the news in vastly different ways. Some comply with the government’s encouragement to adhere to the 24-hour clock, allowing their days and nights to fall quickly out of sync with the hours of light and darkness. Others spurn “clock time” and live according to the changing cycle of the moon and the sun, sleeping and waking for increasingly long periods of time. Julia’s best friend’s family moves to a Mormon settlement in the desert of Utah, leaving Julia feeling lost and alone. As the days lengthen from 24 hours to 32 hours to 40 hours, birds fall from the sky and die in droves, and whales beach themselves on the coastline bordering Julia’s formerly idyllic suburb. Years-long friendships dissolve into nothing, marriages are strained, and some people develop a strange sickness that can only be explained by the changes in gravity. But through all of the fear and confusion, life must go on. Every character in this book has a different reaction to the slowing, but they each have to continue living their lives. Julia is 11 and has her whole life ahead of her. Despite the radical changes to the world around her, life as a middle-school student carries on much the same as always. Like any adolescent girl, Julia faces bullying from schoolmates, cruelty from former friends, and the pangs of crushing on a boy. Through all of the danger and uncertainty, Julia has no choice but to keep on keeping on. As a coming-of-age story, this novel is incredibly poignant and moving. The Age of Miracles is addicting. The first sentences grabbed me immediately, and I could hardly bear to put this book down to do silly life things like shower and go to work. The story is original and gives you a lot of questions to ponder, and Julia is such an innocent, sympathetic narrator. I think I’ve said it before, but I’m not often moved to tears by what I read. Occasionally a few salty drops will swim to the surface of my eyes, but they rarely spill out. 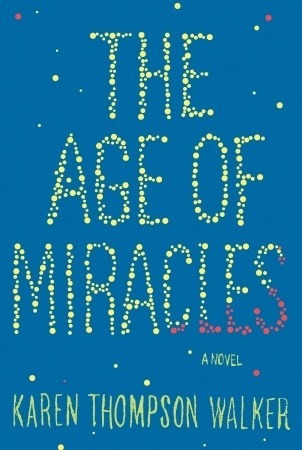 The Age of Miracles, however, made me ugly cry. I could barely read the last 10 pages or so for the sobbing. This story, with its portrayal of love and loss and carrying on in the face of overwhelming hardship — with its story of humanity, in short — is absolutely heartrending. To say that this book had me in tears is just about the highest recommendation I can give. It really was! This book made me feel All the Feelings. I also loved this book! I had heard so many great things about it before reading it, and then once I read it, I started to hear a few criticisms (which I kind of thought were dumb ones) and I was really surprised! It was such a quick read, with the scary threat of Earth’s potential destruction, and really kept me hooked from beginning to end. I’m so glad you liked it, too!!! I haven’t read any reviews besides yours, but I heard at least three podcasters talk about how great this book is. What were the criticisms you read? Looooved it! One person said that they didn’t like how the book was told in a more adult voice. My response was that she WAS an adult when telling the story, looking back at that time. The same person said that she didn’t think the bullying incident at the bus stop leading to nothing was realistic. Having been a 5th grade teacher, it’s very realistic for a bullying event to happen one time and nothing to come of it. Especially when the main character didn’t tell any adult about what happened. And many times, bullies will just ignore the person they just picked on. They were scared kids going through their own personal changes, so I thought the scene (and the other bus stop scenes) were actually something that could have happened. Those do seem to by silly criticisms. She’s telling the story at age 23, I think, so the adult voice makes sense. I agree with you that the bullying incident not having consequences was realistic. Bullying is common among kids their age, and I think a lot of kids who are bullied are too embarrassed or ashamed to tell an adult. The lifting of her shirt and exposing her was a little extreme, though. Yes, it was extreme, but still realistic. This book made me ugly cry, too! Oh my goodness, my heart was broken in the end. Ashley read it when I was done, and it made her very sad, too. Sigh. Hah! I think it’s the sign of a very good book that it can make us all cry like that.